First quarter net interest income was NOK 29.9 million and the net interest margin was 8.7 per cent. Operating costs were NOK 20.3 million, an increase of NOK 4.5 million mainly due to increased marketing costs and one-off expenses associated with listing the bank’s shares at Oslo Børs’ Merkur Market. Net total loans amounted to NOK 1 162 million excluding prepaid agency commissions and unspecified loss provisions, an average increase of 38 per cent compared to fourth quarter 2016. The credit quality continued to improve, in line with projections. Per year-end 2017, Monobank expects net loans in the Norwegian market to be around NOK 1.8 billion. Additional loan volume will be generated from the loan operation in Finland. The bank will take a prudent approach to the new market. Deposits from customers amounted to NOK 1 138 million. Per year end bank deposits and holdings liquid securities were NOK 255 million and total equity amounted to NOK 334 million. Loan provisions amounted to 1.9 per cent of loans in the quarter, and gross loans in default since the bank commenced regular banking operations was 4.9 per cent of average gross lending. Monobank will continue to evaluate other business opportunities that may complement or enhance the bank’s core product. Recent proposals for changes in regulatory guidelines are not expected to have a material effect on the way Monobank currently conduct its loan business. “We´re pleased to record another solid quarter, with increased net profit and strong loan growth. To be able to grow the portfolio in this pace and at the same time improve credit quality is an evidence that our selective risk and customer selection model works. When we have developed this platform to become multinational, we can take out scale on another level than today. 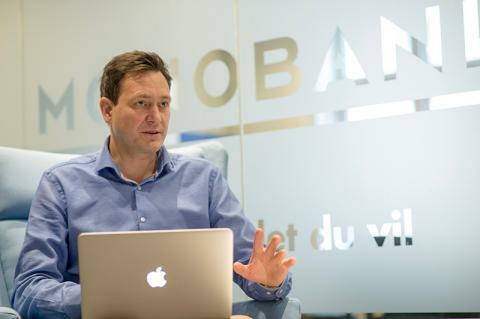 Digital banking with automated solutions are the core of Monobank´s strategy, and we believe our solutions provides us with a competitive edge that we are eager to utilize both in our domestic market and abroad”, said Bent H. Gjendem, Chief Executive Officer at Monobank. For further information, please visit the company web page www.monobank.no.